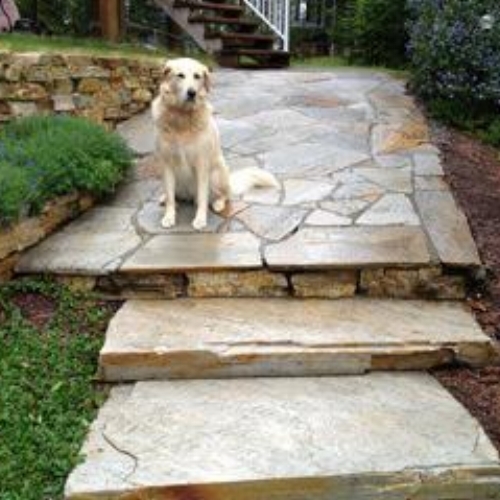 Flagstone is the most popular item here at Hillside Stone & Garden, and for that reason we carry a large variety of sizes, thicknesses and colours. 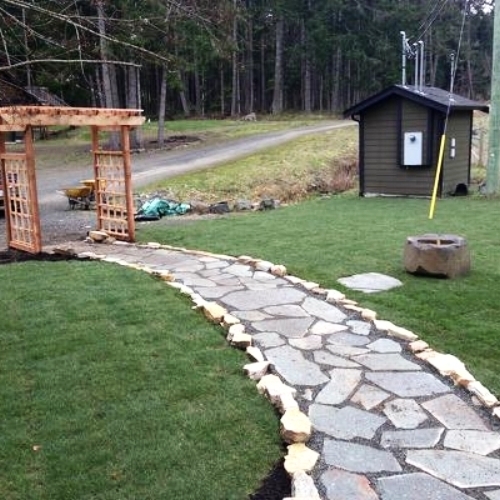 Flagstone can be used to create both dryset patios or walkways, setting the stones down into a bed of cart path or sand. It can also be used with mortar to create a more permanament patio or pathway as well. Thin flagstone (3/8"-3/4") can also be used as a veneer for a fireplace, outdoor bbq or house exterior. We have a very large variety of bluestone. It is availale in an irregular in both an inch or an inch and a half thickness. We also carry a cut product that comes in both an inch or inch and a half thickness and a large variety of sizes including: 12x12, 12x18, 18x18, 18x24, 24x24, 24x30, and 24x36. We also have a tumbled version also in a variety of sizes as well as slabs and stair treads.